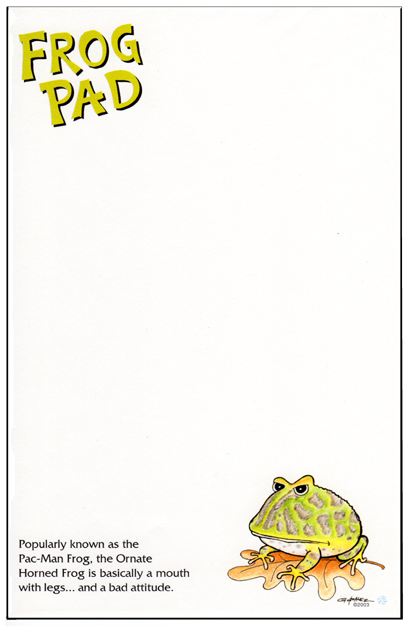 Get your very own Frog Pad today! 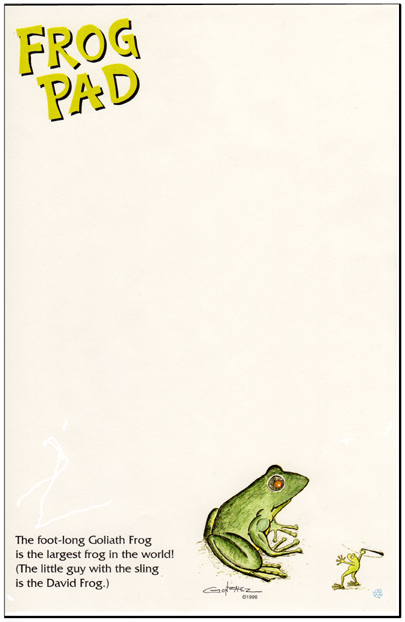 Cuddly and cute, these note pads are perfect for all of your daily notational needs. Jot down phone numbers, make a grocery list, or just doodle mindlessly! Choose from six different species. They are 8.5 x 5.5 inches in dimension and have approximately 35 sheets per pad. 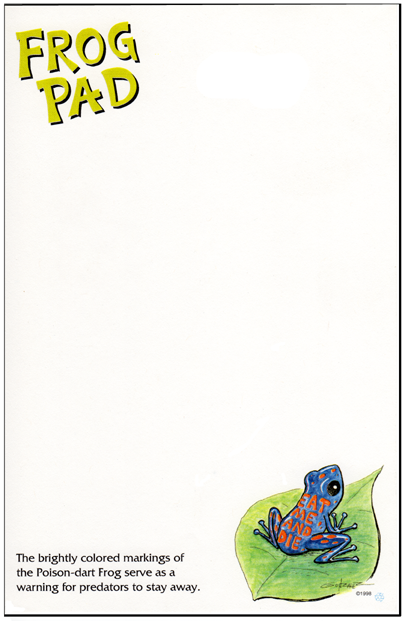 For a little bit more money, you can also purchase a Variety Pad that has all six species in it! 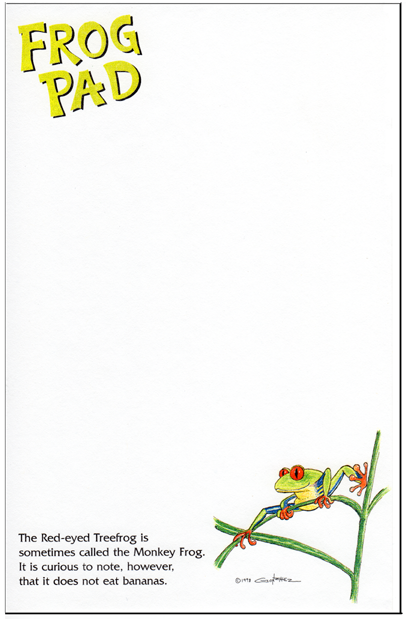 The Frog Pad is printed on high quality 60# recycled white paper and, staying true to the theme, is bound together with green glue. These are not available in stores. 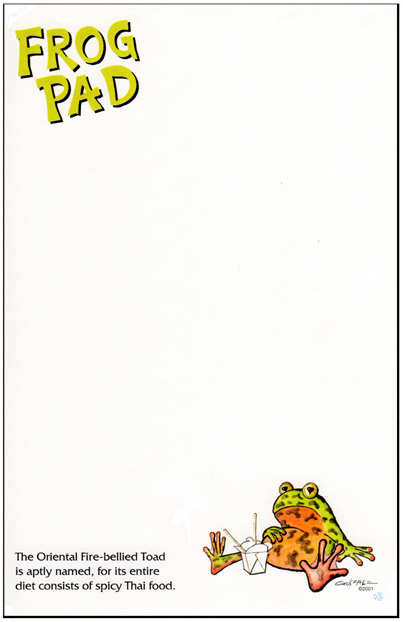 The Frog Pad is a truly unique product that you can buy only from me. Scroll down and check them out! The Variety Pad is $4.00. The Variety Pad has only approximately 30 sheets per pad. However, it has all six Frog Pad designs throughout the entire pad. Free shipping! I designed, wrote, painted, printed, cut, padded, and glued the Frog Pad. The only part of this creation I cannot claim is the Frog Pad lettering at the top of the pad. Jim Vokolopolous did that for me, and I must say he did a good job. Jim is the former graphic artist of The Flint Journal. 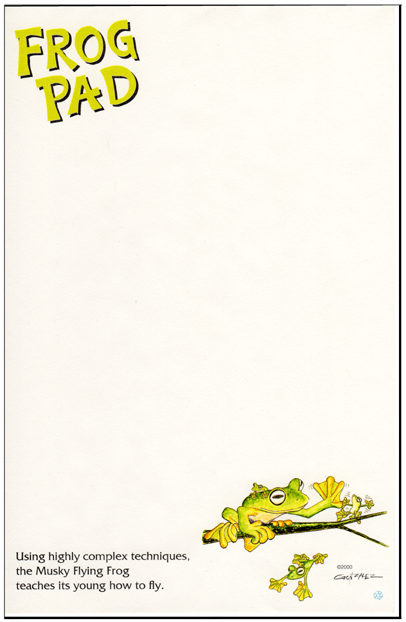 The Frog Pad designs were created with pen and ink, and painted in watercolor. Although I did almost all of the work in producing the Frog Pad, I need to give thanks to those who helped me along the way. Thanks to Jim Vokolopolous, Lee Indianer, Amy George, Matt Studt, Joe Ford, Roni Lane, Scott Brown, Jeff Striler, Bill and Ellen Burgess, and Jack and Kelly Sanders. Your frog pads are so funny! Will you ever make a “cat pad”? Like, a cat pad with similar jokes? I love cats! I’ve just never had the urge to draw them in great detail. I’m glad you enjoy the Frog Pads, though! Thank you very much for thinking that they are funny! I never thought about a cat pad. It is a good idea though. I love the Frog Pad, and would really love to see the Poison Dart frog on a t-shirt. Any chance that might end up on your Cafe Press product page? I would love to do that for you, Melissa! My computer just died, so I got a new one and everything is weird, now. Give me about a week and I will make that happen. Go here to get rewards for being my Patron! Go here to buy Oddbox Comics Merchandise! click on the image below to visit the chico and the chupacabra site! Oddbox Comics Powered by WordPress.com.